Papua New Guinea has once again reached another milestone in development yesterday when a ground breaking ceremony was held to mark the start of a garment factory which is the first largest of such in the country to cater for fashion and clothing needs in PNG. 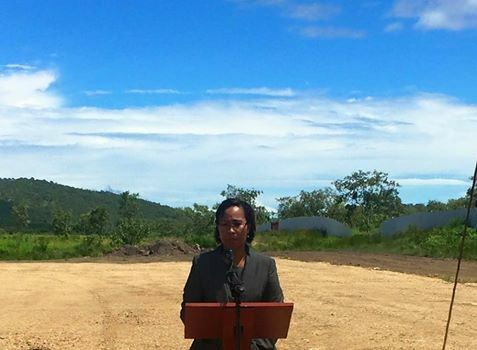 This factory which will be built at the Boera Village just outside Port Moresby city will provide employment and training to women in the surrounding areas to work in the tailoring factory. The factory is an investment by the After Dark Fashion which is 100% Papua New Guinean owned. Managing Director and owner of After Dark Fashions Cathleen Ipi Johnson from the Central Province who has been an entrepreneur in the tailoring industry for 12 years said this investment is a risk in her business that she is willing to take as it will also empower other women in the surrounding areas through employment and training. Present at the ground breaking ceremony was the Minister of Community Development Delilah Gore who said the current government is committed to supporting local entrepreneurs and the Small to Medium Enterprise sector. The minster also committed K10, 000 to the factory.